Everyone likes to see or know a little about software before its released, so I thought I'd give a quick preview of the upcoming release of SafariTabs, especially to those who requested new features. After getting some great feedback with the release of version 0.5 I compiled a list of new features intended for 0.6, but the very nature of developing a SIMBL based plugin has meant that not all of these features have been implemented. Without going into too much detail, the development of SIMBL plugins is intended to provide additional features and functionality to applications that don't provide a traditional plugin architecture and API. Having said this the basis of development is focused on trying to reverse engineer Safari using only its header files (which have to be extracted in the first place) meaning some of the desired functionality cannot be implemented because of either of the following reasons; I just can't figure out how to or its just not possible using the level of exposure to Safari's internals that I am confined to. Anyway, enough of what version 0.6 is lacking and more of what its not. One of the main features that was requested was the ability to select which tabs to restore rather than having them all restored, which is SafariTabs' current behaviour. This was the feature out of all of them that I thought SafariTabs was missing and was also the most relevant once I realised that most people would rather choose their tabs when launching Safari rather than when they are quiting. It was also the easiest to implement as the core behaviour of saving and restoring tabs was already in place. Basically, my initial idea to offering the option of choosing which tabs to restore was to add an additional button to the basic Cocoa dialog that is already presented (as seen above) when Safari launches if the user has the 'Ask me what to do' option enabled. This option would then present the panel below with the option to choose which tabs to restore. This idea worked well but after testing it a couple of times it seemed that is was presenting too many options and different dialogs before Safari was fully launched with your desired tabs. To keep a long story short the end solution is the same initial 'Ask me what to do' dialog and the same tab restore panel, the only difference being that they are now the same dialog. 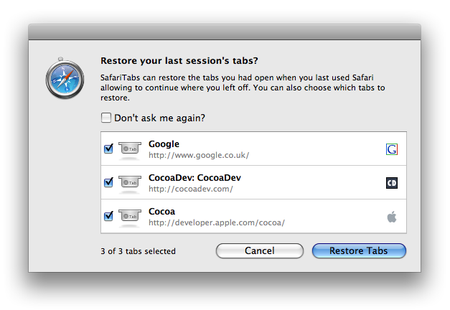 Upon selecting the 'Choose Tabs' option the dialog will transform into the tab restore dialog below and vice-versa when selecting 'Cancel'. All this with a little animation added just to make it flow a little better as well as enhance the overall experience. Aside from letting you all know what's in store for SafariTabs, this preview also gives me chance to get some pre-release feedback. So if you have any last minute requests relating to the new tab restore options or you're willing to participate in some informal testing that will eventually benefit all users, then just leave a comment or drop me an email. I very much appreciate all the feedback that I receive regarding SafariTabs as well as those of you who are willing to take the time to perform testing. Speaking of testing I don't know if anyone has noticed the dramatic reduction in the number of bug fix releases there were when I first started developing SafariTabs compared to now. There is currently only a few, very minor bugs to be resolved, but expect SafariTabs 0.6 sometime within the coming week.